Society for the promotion of Jewish interests, founded at Vienna in 1872 by Joseph Ritter von Wertheimer, and modeled on the Alliance Israélite Universelle of Paris. Its establishment was directly due to the oppression of the Jews in Rumania and the excesses committed against the Jews in Asiatic Turkey. The organizers, among whom were the publicist Ignatz Kuranda and the poet Leopold Kompert, proposed as an important part of their program, to improve Jewish education in Austria and more especially in Galicia by organizing and supporting schools, and by other suitable means. The other object of the society, "to afford efficient relief to Jews where they still suffer by reason of their race," claimed subsequently the larger part of its attention, in consequence of the many persecutions in the countries on the eastern border. 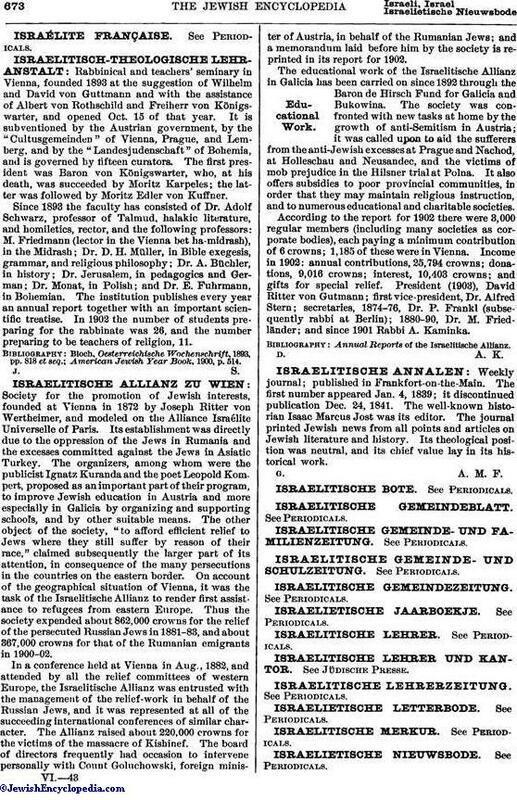 On account of the geographical situation of Vienna, it was the task of the Israelitische Allianz to render first assistance to refugees from eastern Europe. Thus the society expended about 862,000 crowns for the relief of the persecuted Russian Jews in 1881-83, and about 367,000 crowns for that of the Rumanian emigrants in 1900-02. Annual Reports of the Israelitische Allianz.